← Slides, handouts & coverage from Red Cross presentations are posted! Reminder: training session on Monday, April 18th! 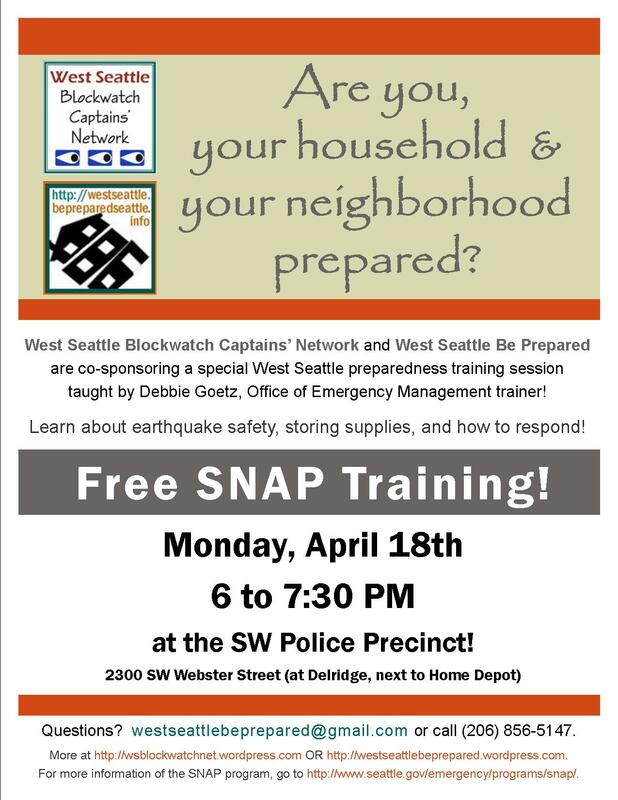 Lest it get buried too far down the page & off the radar, here’s a reminder about the SNAP neighborhood emergency preparedness training next Monday, April 18th! It’s from 6 to 7:30 PM at the Southwest Police Precinct (2300 SW Webster St, at Delridge, next to the Home Depot). West Seattle Be Prepared and the West Seattle Blockwatch Captain’s Network are co-sponsoring this special West Seattle session with Debbie Goetz, Office of Emergency Management trainer. Debbie makes learning about preparedness fun & this session will be tailored to the needs of the audience – so it’s a great opportunity to bring any questions or concerns you may have about how to prepare. Hope to see you there! This entry was posted in Events, Training & Education series, West Seattle Be Prepared and tagged Debbie Goetz, Seattle Office of Emergency Management, SNAP training, West Seattle Blockwatch Captains' Network, West Seattle emergency preparedness. Bookmark the permalink.